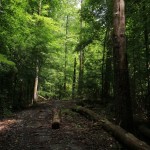 Description: This 100+ acre nature preserve is home to both paved and natural-surface trails. It is also home to a wide variety of plant and animal life. 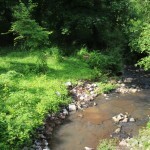 The nature preserve is largely mature forest. A map of the paved trails is available from the PATH Foundation. There are plans to one day connect these trails to the Beltline. What’s there: Paved and natural trails, creek, playground, fitness trail. History and historical markers: The preserve is a combination of two tracts: One is named after the previous land owner, jazz musician Lionel Hampton, and the other shares the name of nearby Beecher Hills school. There is a nearby historical marker summarizing the Battle of Utoy Creek. The park contains trenches and fortifications used by Union troops in the Battles of Ezra Church and Utoy Creek. This blog post provides a photo of the trenches. Not mentioned on any historical marker, near this site were the locations of the Peyton Road wall, barriers meant to prevent African Americans from easily entering the Cascade Heights neighborhood. Champion trees: There are three champion trees in the park: a sugar maple, an umbrella magnolia, and a tulip poplar. 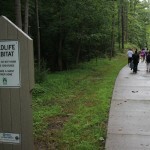 You can read more about these and see where they are located on our Atlanta Greenspaces map. Mileage: About 1.8 miles of paved trails, plus about another mile of unpaved trails. 4+ miles total, round trip. Address: 310 Willis Mill Rd, Atlanta, GA 30310 Also accessible from Flamingo Dr SW and other trailheads.